2 Division of Neonatology, Uludağ University Faculty of Medicine, Bursa, Turkey DOI : 10.24953/turkjped.2017.02.003 Yılmaz C, Köksal N, Özkan H, Dorum BA, Bağcı O. Low serum IGF-1 and increased cytokine levels in tracheal aspirate samples are associated with bronchopulmonary dysplasia. Turk J Pediatr 2017; 59: 122-129. Despite developments in the perinatal and neonatal care, bronchopulmonary dysplasia (BPD) is still the most frequently seen long-term complication in preterm infants. The aim of this prospective study is to investigate the association between the development of BPD and serial measurements of IGF-1 levels and their relationship with levels of IGF-1 and cytokine in tracheal aspirate fluids. A total of 40 premature infants, born at a gestational age of ≤ 32 weeks, were enrolled in the study. On postnatal day-1, 3, 7, 21 and 28 serum IGF-1 levels and IGF-1 levels, IL-6, IL-8, IL-10 and TNF-alpha levels in tracheal aspirate fluid samples of intubated cases were examined. Mean gestational age of 40 patients included in the study was 29.41 ± 2.23 weeks, and their mean birth weight was 1,256.85 ± 311.48 g. BPD was detected in 35% of cases. Mean gestational week and birth weight of the cases that developed BPD were 30 ± 3 weeks and 1,150 ± 295 g, respectively. 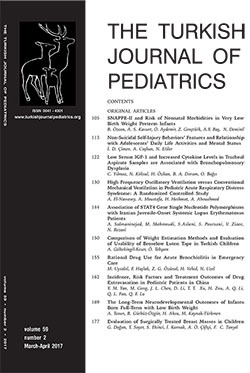 Serum IGF-1 levels on postnatal day-1, 3, 7, 21 and 28 in cases who developed BPD were significantly lower when compared with those without BPD (p < 0.01). Levels of IL-6, IL-8, IL-10, and TNF-alpha in tracheal aspirate samples were significantly higher in cases with BPD compared to those without BPD (p<0.05). IGF-1 levels in tracheal aspirate fluid samples did not differ significantly based on the presence of BPD (p>0.05). Severity of BPD was associated with decreased serum IGF-1 levels and increased cytokine levels in tracheal aspirate samples. Keywords : bronchopulmonary dysplasia, cytokines, IGF-1, premature, tracheal aspirate fluid.